Syngenta India limited set up the Syngenta Foundation as an independent organization in 2005 to help marginalized farmers adopt improved production technologies for better productivity and higher incomes. The Foundation is working with a number of local NGOs and other associations on resource conservation and crop enhancement projects to provide long term productivity and income generation for the farmers. 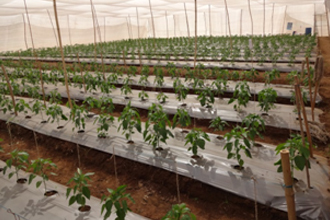 We also establish partnerships in areas as varied as seed supply, environmental services and food processing. Phase I (2005-2009), SFI launched three extension-driven projects in disadvantaged regions and introduced high-performing seeds, improved agronomic practices, and new technologies for control of pests, diseases and weeds. New departures included special techniques such as SRI (system of rice intensification), mechanization in rice, and raising seedlings in poly-houses. With improved yields, farmers started to trust SFI and the technologies it introduced. SFI then embarked on Phase II (2009-2013) with ‘market-led extension’, where the emphasis was to ‘produce together and sell together’. Essential features of this approach included linking vegetable producers’ groups with markets through fewer intermediaries. Phase II also witnessed substantial contributions to policy, notably in a research project on transforming agriculture to support overall economic growth. This work led to a major book, "India 2040 -Transforming Indian Agriculture: Productivity, Markets and Institutions". Buoyed by the success and strong basis of these phases, SFI is now shifting gears rapidly. Phase III (2014 onwards) is going for impact at scale. The core task remains unchanged: create value for farmers, help modernize agriculture and the food system, and be an intelligent catalyst. The approach for Phase III is to develop ‘enablers’ which can be replicated in different locations. SFI intends to introduce enablers in domains such as financial solutions (including insurance), ICT and mobile computing, irrigation solutions, agro-processing and farm machinery. Overall, the Foundation has investigated a range of models designed to improve the farming practices and livelihoods of resource-poor smallholders. One example of this range of models in Kalahandi is the recent initiative to educate "Barefoot Extension Workers". SFI supports a three-month course on modern agricultural techniques. This provides specific knowledge about local crops. As well as benefiting their own family farms, the course enables the participants to advise their neighbours on improved agronomy, market intelligence and connections to markets.Meet Bhagirathi Naik. 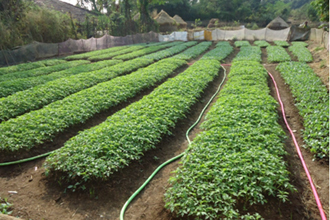 SFI has developed a unique 'cluster-based' approach to agricultural extension. 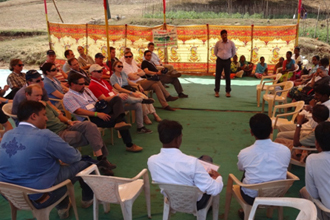 In each project area, an extension worker serves a cluster of villages, with guidance from a team of experts. The extension worker holds frequent farmer meetings, and the team runs seasonally adapted training programs. Demonstrations of new techniques and products take place directly in the farmers’ fields, combined with visits to particularly progressive farms. In some areas, SFI also organizes annual fairs to introduce large numbers of farmers to the latest inputs, processes and equipment. The most significant achievements, however, have come in the cultivation of high-value vegetables. By following our recommendations, farmers now earn incomes that are transforming their livelihoods. 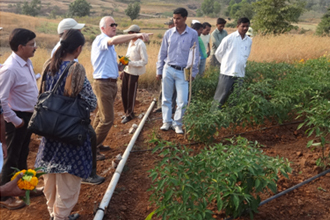 SFI has been successfully implementing market-led extension in vegetables in four locations: Jawhar in Maharashtra, Kalahandi in Orissa, Kesla in Madhya Pradesh and Bankura in West Bengal. High-value vegetable cultivation requires access to high-quality seeds and other inputs. SFI and its NGO partners help farmers get the best varieties in terms of season, cost and local availability. SFI’s revolving fund enables purchase from a nearby wholesaler at better prices than if each farmer went alone to a retailer. The project partners also familiarize farmers with seed selection and nursery management. This new knowledge has encouraged many farmers to construct their own low-cost polyhouses for raising seedlings. SFI helps farmers identify pests and diseases, and suggests remedial measures. Regular monitoring has improved crop quantity and quality. At village / cluster level, SFI has established Agricultural Information Centres (AIC) that also serve as collection points. At AIC, the Foundation provides information and training on agronomy, harvesting, grading, sorting and packing. Connecting farmers to markets is a complex process. 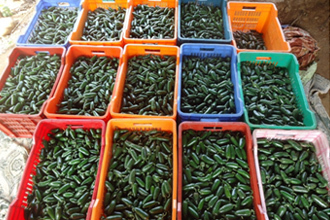 The process starts with market research: detailed analysis of the demand for various vegetables in nearby markets. The farmers are involved in the research, and translate the demand into crop planning. SFI helps schedule harvesting so that there is enough marketable surplus for a prolonged period. The Foundation’s local representatives understand the price situation for major commodities throughout each project area. They inform the farmers, who take their own call on harvesting. Once decided, a group of farmers harvest their produce and undertake primary sorting and grading. The nearest collection center does the final grading and packaging. The produce is weighed accurately using electronic scales provided by SFI. Phase III of the SFI activities seeks to develop scalable solutions rather than add further MLE projects. One such model uses agri-entrepreneurs (AEs) to anchor market-led extension in vegetables. SFI supports the entrepreneurs at business start-up. Thereafter, they work independently with neighboring farmers on a commercial basis. 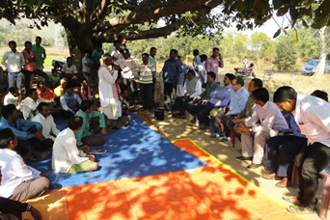 SFI connects the entrepreneurs to IDBI Bank, which provides credit both to the AE and their farmer clients. With this support, the entrepreneurs can consider their business as social enterprises and help farmers at every stage in the value chain. Further scalable solutions under development include irrigation systems for tribal communities, community-owned agro-processing and seed units, and index insurance for farmers producing seed.